Fig. 4-185. 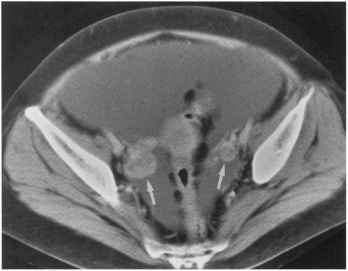 Omental caking demonstrated secondary to ovarian carcinoma. The greater omentum, in contrast to the small bowel mesentery, has scanty vascular structures. 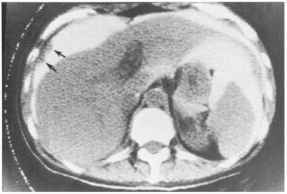 In this patient with portal hypertension and ascites, omental varices (arrows) may mimic omental infiltration from carci-nomatosis or peritonitis. Fig. 4-188. Sister Mary Joseph's nodule. 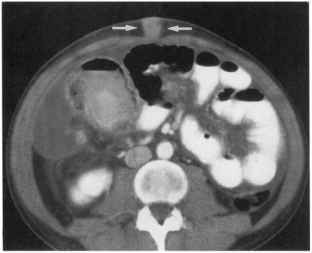 A soft tissue mass (arrows) is present in the subcutaneous tissue at the level of the umbilicus, metastatic from a primary gastric adenocarcinoma. 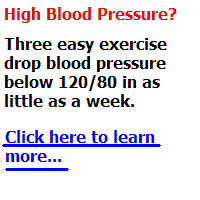 Note that it causes no discernible bulge of the skin surface. 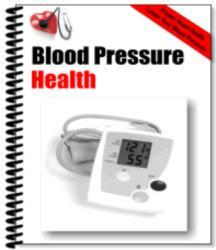 Generalized ascites is seen. Fig. 4-189. Sister Mary Joseph's nodule. 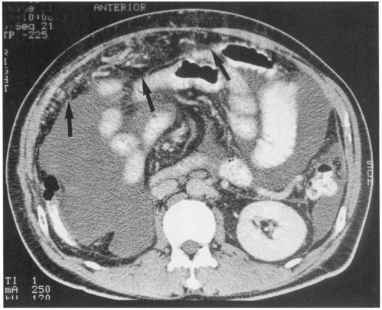 CT demonstrates a large umbilical nodule with central necrosis (arrows). In this 33-year-old male with adenocarcinoma of the esophagogastric junction, carcinomatosis included a lesser omental mass (coronary lymphadenopa-thy) and bilateral adrenal metastases. Fig. 4-190. 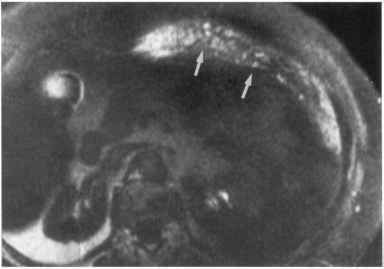 Incisional recurrence mimicking a Sister Mary Joseph's nodule. Tumor cells seeded at a surgical incision yield a subcutaneous mass (closed arrow) that appears to extend into the fat pad of the falciform ligament. 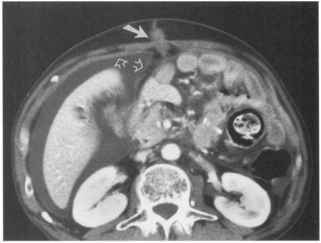 This is associated with enhancement and thickening of the peritoneum (open arrows) and ascites in this patient with peritoneal carcinomatosis. 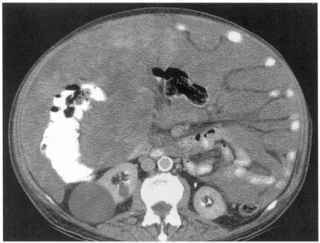 It remains questionable whether the mass truly represents an umbilical metastasis that developed after the surgical procedure. from increased vascular-peritoneal permeability. ' Similar results have been reported for MRI using delayed gadolinium-enhanced sequences.138,215 Positive-contrast peritoneography has been used in the demonstration of abdominal metastases.70,216,217 When coupled with CT,218-222 it may further enhance the demonstration of small peritoneal lesions (Fig. 4-196), but small implants in curved recesses may be missed on axial sectional imaging. CT with induced pneumoperitoneum widi C02 has been reported with disclosure of implants even <2 mm in size (Fig. 4-197), but with significant limitations.223 Abdominal ultrasonography has revealed signs for peritoneal carcinomatosis that account for malignant ascites in 78-92% of cases.224-227 Using highresolution ultrasonography, Rioux and Michaud132 documented omental, serosal, and peritoneal implants. Fig. 4-191. Bilateral Krukenberg tumors of the ovaries secondary to gastric carcinoma. (a and b) Contrast-enhanced CT reveals diffuse infiltration of the greater omentum and small bowel mesentery with tumor. 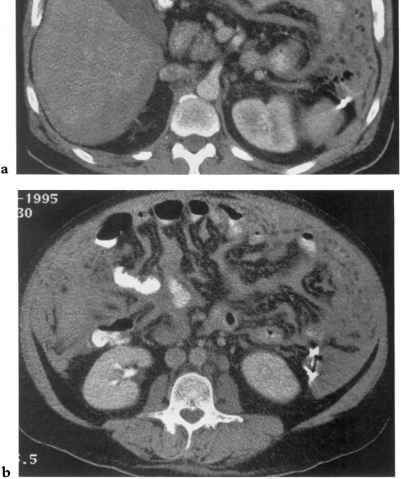 Ascites is a less impressive finding with peritoneal mesotheli-oma than it is with peritoneal carcinomatosis. Fig. 4—194. Subcutaneous implant tumor from serous ovarian carcinoma following paracentesis. Fig. 4-195. Peritoneal seeding at site of needle track. Eight months after percutaneous ethanol ablation therapy for hepatocellular carcinoma. 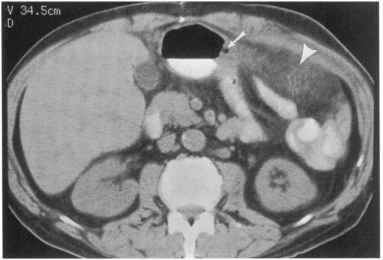 (a) CT shows small firm nodules at the sites of the punctures attached to the peritoneum (white arrows). 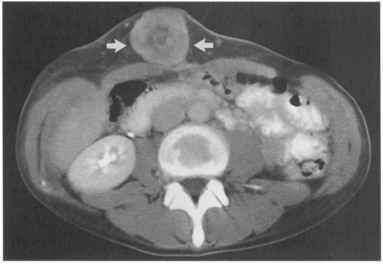 Part of the primary tumor is indicated (black arrow). improvements. Seeded peritoneal metastases may be evident as discrete nodules59,106,132,140 or as peritoneal thickening and enhancement.138 Saline MR peritoneography, heavily T2-weighted images in conjunction with intraperitoneally instilled saline, may enhance the detection of small implants on peritoneal surfaces.229 Ra-dioimmunoscintigraphy230 may be applied to the detection of peritoneal carcinomatosis. Fig. 4—196. 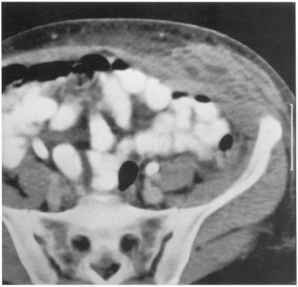 Peritoneal seeded metastases.